This is the biggest shelf in my room, it used to house my TV, and it currently houses most of my TBR pile, which is fairly considerable as you can see. Some of these I've started but just haven't had time to finish yet, but hope to soon. In particular I've almost finished Beauty Queens and am partway through Pure, which as I have the sequel to, am eager to finish. 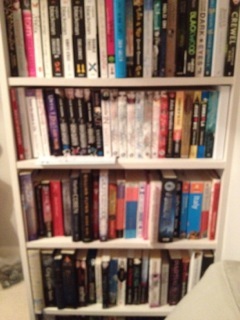 I did try and arrange my shelves by genre, but it got quite difficult so now I have a couple of shelves that just house 'general' fiction where I attempted to sort my shelves, like the bottom one here which has some of my crime books, Margaret Atwood and some classics too. Also the Hate List is shown and that's the first book I ever featured on my blog, I just adore her writing! 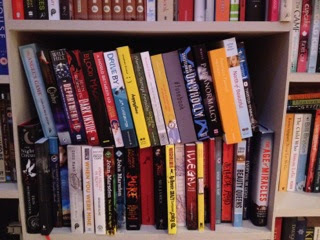 Above this, we have the top shelf which has some brilliant books on it, including two of my favourites: The Book Thief and the Outsiders. 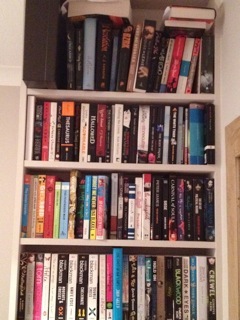 The shelf below that contains general fiction again and includes a couple of uni books like Lanark. The rest of my uni books are actually in the garage, but I don't have space to bring them into the house as you can see. Below that is more YA, including 0.4 which I loved, the Taken By Wolves trilogy and Raw Blue which again I highly recommend. 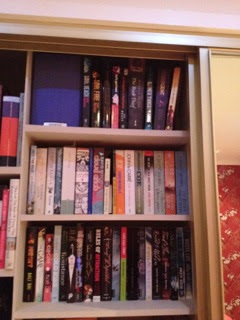 This is the shelf above that giant TBR shelf and includes some classics, like Dante and Jane Austen (it's a gorgeous set and the pages have gold edging) along with some poetry collections, some YA, some general fiction (I love Jon McGregor and he came to my uni to talk to the MAW programme and was delightful, and signed my book) YA wise, Skin Deep was one of my favourite UKYA books this year. 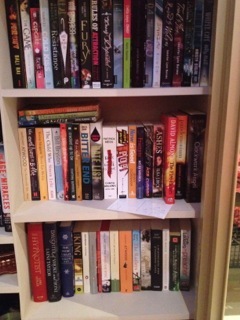 This blurry photo is most of my bookcase in the study. There are actually two shelves below this, but I have a chair and 100+ books for donation in the way there. Books to point out include my copy of the Tibetan book of the dead as I was really interested in Buddhism as a teenager, it's the one at the bottom left next to City of Lost Souls. I also have a shelf almost filled with MIRA ink books from when I won a giveaway last year and including the Iron Fey and Soul Screamers series, which I love! 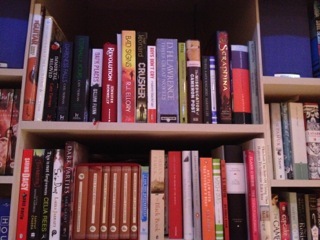 There are some travel books below this from when I was travelling in Italy and some classic Bill Bryson next to that. The top shelves of my messy bookcase include more mixes of genres, but I particularly want to mention House of Leaves which is one of my favourite books and a truly bizarre and creepy read. It just completely flips how you look at narrative and has a cult following.